Genetic techniques to analyse modern and ancient DNA have improved dramatically within the past 25 years. A striking demonstration of this was Orlando et al. 's successful recovery of a DNA from 22 of 35 teeth of Equus, dating to the Late Pleistocene or Holocene. Four of the teeth which were successfully analysed for ancient DNA were attributed to E. capensis, a species which has been thought to have become extinct in South Africa in the Late Quaternary. Other fossil equid specimens in the analysis were from sites in Europe, Asia and the American continents. The extraordinary ancient DNA results by Orlando et al.1 were published in a recent issue of the Proceedings of the National Academy of Sciences. They were obtained from two separate laboratories: one in Lyon in France under Ludovic Orlando himself and the other, at Adelaide at the Australian Centre for Ancient DNA, under the direction of Alan Cooper. The paper was co-authored by a team of 21 other researchers from many parts of the world. After checking and controlling for contamination, the team used the DNA results to explore phylogenetic relationships. The DNA clearly separated Old World non-caballine equids from caballine and New World horses. In the case of Africa, the four specimens attributed to E. capensis (three from Wonderwerk Cave, and one from Glen Craig Shelter near Port Elizabeth) grouped closely with specimens attributed to E. q burchelli and E. q quagga. Specimens of the latter taxon were obtained from the Iziko Museums (South Africa), the Yale Peabody Museum (New Haven, USA), as well as the Darmstadt and Berlin museums in Germany. Equus greyvi from Ethiopia and Kenya appears to group more closely with Asian asses than with the South African zebras. 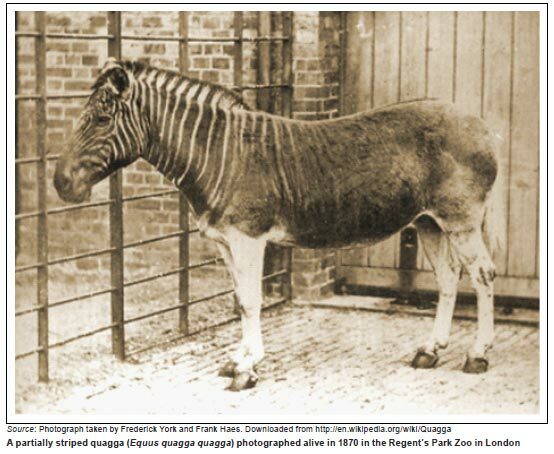 The mountain zebra (E. hartmannae) does not group with E q. quagga or E. q. burchelli. Instead, the latter two taxa are more closely related to each other than either is to the mountain zebra, E. hartmannae. These exciting results constitute an important milestone in the growing understanding of equid phylogeny, not only in terms of African zebras, but also in relation to Late Quaternary equids from Europe, Asia and the Americas. The study adds credibility to ancient DNA studies, given appropriate sampling and preparation techniques. Sites such as Wonderwerk Cave in South Africa have excellent preservation. This cave has yielded extinct ungulate horn samples with keratin believed to be as old as 500,000 years BP, if not older.9 Keratin samples are currently being acquired for DNA analyses to supplement existing results obtained from this site. Wonderwerk is believed to have a cave sequence extending back 2 million years. At Wonderwerk, preservation is such that nitrogen, as well as carbon stable isotopes, can be measured in equid teeth.10 Orlando et al.1 have set the stage for exciting new developments in palaeogenetics, with special reference to South African fossils.